Join Lucky Larry as he makes his grand entrance at Slotorama with one of the most popular slots that has ever existed, Lobstermania! Players throughout the world have followed Lucky Larry for decades in the quest to catch their big win and he has helped some dreams come true. Join Lucky Larry as he makes his grand entrance at Slotorama with one of the most popular slots that has ever existed, the Lobstermania slots game! Players throughout the world have followed Lucky Larry for decades in the quest to catch their big win and he has helped some dreams come true. 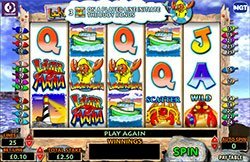 The online version of the game features big colorful graphics (lobsters, crabs, lighthouses) just as the original does and the B-52s classic ‘Rock Lobster’ soundtrack plays in the background similar to the land-based casinos. In fact, this online version is a replica of the one you might find in your local casino. And if you’ve played this game before, you know that when it hits, it can hit BIG! Play slots for real money at Dreams Casino, All Players Welcome! Wild Symbol: The Lobster wearing sunglasses is the wild symbol and will substitute for all other symbols except scatter and bonus symbols to complete winning combinations when possible. Scatter Symbol: The scatter symbol is represented by the Crab and getting 3 or more scatters anywhere on the reels pays well. Hitting 3 scatters gives 4x total bet; 4 gives 25x total bet and 5 gives 200x total bet as a prize. The Great Lobster Escape Bonus Round – The Great Lobster Escape Bonus Round involves Lucky Larry helping Lobsters escape – for every lobster you help escape you win prizes. When a lobster fails to escape, the game ends. The Buoy Bonus Round – The second bonus game, The Buoy Bonus Round, involves catching lobsters – the more lobsters you catch the more money you win and the bigger the lobster, the bigger the prize. Finding a cage with no lobster ends the game.